Its blooming park with trees, its 4 bedrooms with an individual decoration in a charming-house style, its 3 bathrooms, its wide spaces, its unobstructed views, and its history are assets that few holiday houses can offer. Le Havre has three fireplaces and a sauna to heat your winters. 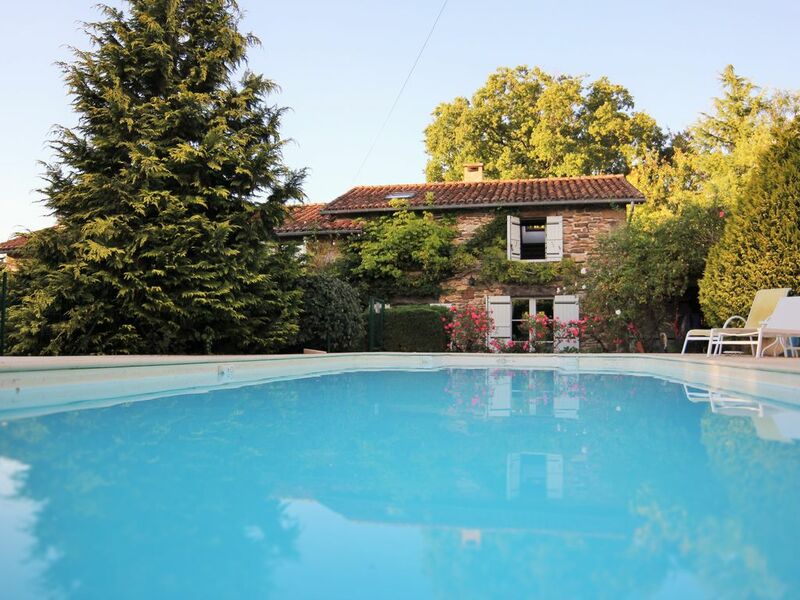 In the heat of summer, its pool, its majestic oaks trees, and its stone walls will refresh you Regardless of the season, Le Havre is an ideal house for a large family or family and friends gatherings. Being away and close to everything at the same time, the house offers an ideal location. It will be the starting point for excursions and adventures as safe and revitalizing base to be back home. We offer an apartment-building-like service, with bath towels and towels ready for your arrival, providing an additional comfort when looking for holiday without any worries. Situated in a hamlet on top of a small hill, we fell in love with this charming stone building in the countryside, in a 60-acre landscaped park with flowers. At the end of a lane, we discover the house that we called Le Havre (haven) because it inspires calm, serenity, and healing. It had everything you need, so you can find a magical place, away from the stress of our cities, and providing all the well-being desired when we had a break. Le Havre is ideally located, without being too much isolated, in the middle of a lovely nature and a region full of historical and gastronomic potential, as well as other necessary activities to spend unforgettable moments. As soon as arrive to Le Havre, you will feel an inner peace and well-being. Renovated with passion and good taste by ourselves, Le Havre welcomes you for an unforgettable stay, and it will surprise you. There are many activities a few steps away. Please, visit our website. Périgord Vert offers a many places and activities to discover; each one is one of a kind. Discover a large varied architectural identity of many castles and picturesque villages that you can visit the along many hiking trails, on horseback, or in a cariole. You can also see the sky in an ultralight plane or by hot air balloon. There are many gastronomic places, with Thiviers, the capital of foie gras, Périgord Vert, and Sorges with its truffle museum. The authenticity of the Périgord invites you to visit Saint-Jean-de-Côle, a village located 4 km away, with its own castle and priory. Now the village is considered as one of the most beautiful villages in France and offers a unique promenade. The historic wealth of Périgord continues attracting people with its many castles around the region. In Château de Puyguilhem, the shooting of "Le Pacte des Loups" took place. You will also find the Abbey of Boschaud, Villars Cave with its cave paintings, the small village of La Chapelle-Faucher, Excideuil, and Saint-Germain-des-Prés. There are many sports activities such as canoeing, horse riding, golf, glider, hot air ballooning, tree climbing, mountain bikes, hiking, and tennis in the near vicinity. For a natural experience, visiting the farms and the local markets will also be on a menu awakening your senses. In the he area, it is also possible to visit beautiful cities full of treasures such as Périgueux or Brantome, the Venice of Périgord. Furthermore, the lane of Santiago de Compostela makes a stop in... Thiviers. We spent a fabulous week at Le Havre, enjoying the heated pool, the range of seating areas, good size kitchen - and very comfy beds. Whilst it is in a very rural location, Thiviers is only 10 minutes away and has a range of supermarkets, shops and cafes. St Jean du Cole is a beautiful ancient village with a good range of restaurants and is a similar drive in the opposite direction. Nos deux familles ont passé un séjour incroyable dans cette superbe maison très confortable. Nous avons profité de la piscine tous les jours. De plus, la région regorge d'activités culturelles, sportives et ... gastronomiques ! Je vous la recommande sans hésitation !!! La maison est charmante, propre et bien équipée, sans aucun vis-à-vis. Le parc est très joliment aménagé. La piscine n'est pas très récente (encore au chlore) mais en très bon état et de bonne taille. L'endroit porte bien son nom puisque c'est un havre de paix absolu, mais qui pour autant n'est pas complètement isolé puisque l'on trouve les 1ers commerces à 10mn en voiture. Une région magnifique avec des possibilités de visites et d'activités très variées. Cerise sur le gâteau: des propriétaires charmants et très à l'écoute de leurs locataires avant, pendant et après le séjour. Exemple: en partant nous avons signalé à la femme de ménage que le lave-linge ne fonctionnait pas. 2 jours plus tard, les propriétaires nous contactaient pour s'excuser, nous confirmer qu'ils avaient aussitôt commandé une nouvelle machine, et nous proposer un dédommagement! Conclusion: à tout point de vue, une destination que nous recommandons chaudement. Once you arrive to Thiviers, which can be reached by the N21 motorway coming from Perigueux or Limoges, take the D707 motorway in the direction of Saint-Jean-de-Côle. 7 km ahead, turn right towards Nontron. In Saint-Jean-de-Côle, turn right in the direction of Saint Martin and Saint Romain. The small road out of Saint Jean, through the countryside, crosses the River Cole. Continue to Saint Martin until you find a sinuous road. Here, the road turns to the left going up. Turn right. 600 m ahead, you will have travelled 2.5 km from Saint Jean, and you will find a three-way intersection. Here, turn right. 1 km ahead, turn left toward Le Maizaraud. 250 m above, you will find the hamlet. The path leading to Havre will be on the left side, and on the right side, there is a stone house. Continue along the lane for 150 m, and you will have arrived. Périgord Vert offers a many places and activities to discover; each one is one of a kind. Discover a large varied architectural identity of many castles and picturesque villages that you can visit the along many hiking trails, by horse, or in a cariole. You can also see the sky in an ultralight plane or by hot air balloon. There are many gastronomic places, with Thiviers, the capital of foie gras, Périgord Vert, and Sorges with its truffle museum. The authenticity of the Périgord invites you to visit Saint-Jean-de-Côle, a village located 4 km away, with its own castle and priory. Now, the village is considered as one of the most beautiful villages in France and offers a unique promenade. The historic wealth of Périgord continues attracting people with its many castles around the region. In Château de Puyguilhem, the shooting of "Le Pacte des Loups" took place. You will also find the Abbey of Boschaud, Villars Cave with its cave paintings, the small village of La Chapelle-Faucher, Excideuil, and Saint-Germain-des-Prés. There are many sports activities such as canoeing, horse riding, golf, glider, hot air ballooning, tree climbing, mountain bikes, hiking, and tennis in the near vicinity. For a natural experience, visiting the farms and the local markets will also be on a menu awakening your senses. In the he area, it is also possible to visit beautiful cities full of treasures such as Périgueux or Brantome, the Venice of Périgord. Furthermore, the lane of Santiago de Compostela makes a stop in... Thiviers. Caution demandée, acompte/arrhes à la réservation, propriétaire non présent sur place. Nettoyage obligatoire à la fin du séjour: 150 Euros (non compris dans le prix de location). Prix chauffage piscine inclus dans le prix pour les mois Mai, Juin, Juillet, Août, Septembre. Chauffage piscine à la demande du locataire pour les mois d'Avril et Octobre. Prix supplémentaire de 100 Euro/semaine.